The last few episodes of the Bedside Table build have been all about milling of components for the project and playing around with joinery techniques. It’s time to start the final assembly. 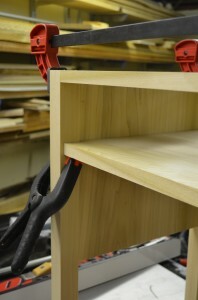 The first step is attaching the dust frames and shelves to the sides. We have a lot of joinery options to get the job done, but in my opinion the one that’s right for this particular project isn’t a complicated one, it’s dowels. Years ago I bought my first dowel jig and feel in love with the simplicity of the joint. Unfortunately I hated the dowel jig! So eventually I abandoned the technique for something else. Recently though I bought a better jig and have started to use dowels in more of my projects. The result is a happy woodworker! In the line up of joinery techniques dowels appear to get a little more respect than biscuits or pocket hole joinery but aren’t on the same level as mortise and tenon or other “traditional” joinery. Seems a shame considering how strong the joint can be, not to mention their versatility in location. Krenov used dowels. That makes them perfectly acceptable around my shop. Now…. I just need a good drilling jig….